Thank you for being part of the twentieth anniversary of A Taste for Life. For two decades funds have been raised for Bruce House and The Snowy Owl AIDS Foundation in this annual evening of good times and great dining. We were fortunate this year to receive complimentary promotion from the Bank St. BIA and the Preston St. BIA. Member restaurants of both organizations have loyally participated in A Taste For Life for many years, illustrating the win-win partnership that is Taste. Fundraising events require hard work, fresh ideas, and a great deal of planning. We are hugely grateful to the members of the 20th Anniversary Steering Committee—James Mickle, Gemma LeGresley, Denis Schryburt, and Thérèse Boisclair—whose contributions shaped this year’s event; to Jen Bruce for her support in finding prizes and supporters; Sonia Okamoto for her tireless efforts promoting on social media; and to the incredible volunteer hosts who helped fill each venue. 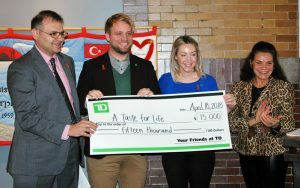 Sponsor TD Bank donated a record-breaking $15,000 to the event and their staff once again volunteered to assist hosts at the restaurants. Turpin Kia and BLG also provided generous financial support, and The Urban Element once again rolled out the red carpet to host the annual launch event. Thanks to the financial support of these sponsors 100% of donations will go directly to programs and services for people impacted by HIV. It will be a while yet before we have event totals to share. We know you want the “big number”, and it will be announced soon! 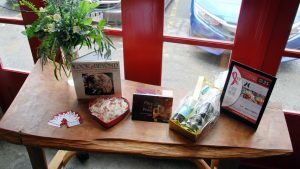 Meanwhile please know that you have the thanks of Bruce House clients, staff, and volunteers for your donations. Funds raised at A Taste for Life contribute significantly to our ability to continue providing services and programs for people impacted by HIV in Ottawa. With the scarcity of funding sources your gifts become more valuable each year.